Kersten’s Retro Renovation blue bathroom turned out beautifully, but she also was honest in sharing some of the problems she ran into. 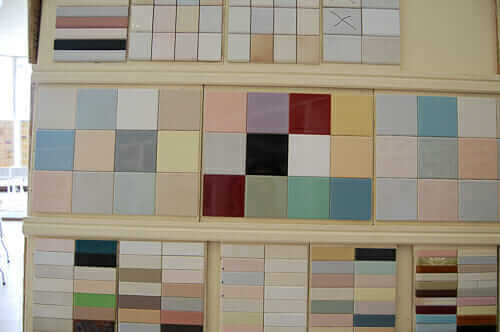 One of them was how the gray grout started to whiten in some spots. When I published her story, I promised to look into the issue, and I think I found the answer. The problem is a relatively common concern in tiling and grouting: “Efflorescence” and “Latex Leaching”. The darker your grout, the more you need to be aware of these issues. I’m not going to try to explain the phenomenon completely here. Instead, I found two online fact sheets that seem to lay it all out. Reading through them, I speculate that Kersten experienced latex leaching. 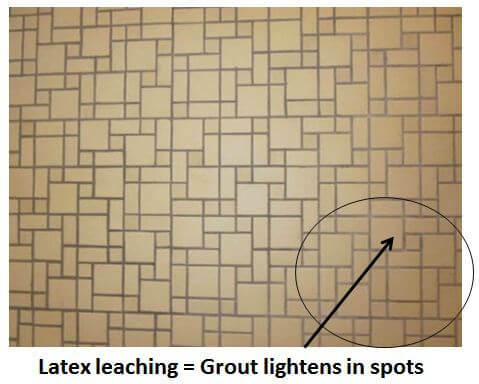 Latex leaching can occur when too much water (or water with chemicals in it) interacts with colored or grey grout mix, causing polymers in the grout to rise to the surface and whiten. A similar phenomenon is efflorescence, in which minerals in the subfloor (often concrete) below the tile rise through the grout and leave a white residue on the surface. Mapei Fact sheet [link now gone, it seems] — Lots of good tips here on mixing and applying grout to avoid latex leaching. Solutions? (1) The Tile USA fact sheet suggests some acids might fix latex leaching; sounds iffy to me, and what would happen to your tile? (2) Use a professional so when it goes wrong you can make him or her do it over. (3) Shop til you find a time capsule, so you don’t have to renovate anything. (4) Another possibility: Use a sand-based grout — presuming there are no polymers — ???? — I don’t know. That’s another story. (5) Lay down a rug, and move on. <– A wise solution. I grouted my bathroom floor with a medium gray grout and it was fine, dried to the right color. I waited for the recommended time to cure and then sealed the grout. As the sealant dried, the grout turned white. Since no water was used in the sealing process and the grout was already perfectly dried and the right color, the process of turning white must have come from the sealing solution itself. I actually don’t mind the white grout lines, but if I ever am tiling again, I’d like to know what happened and if there is any remedy. I suspect this discoloration is due to minerals in tap water that may be considered “hard” water. My floor has the clouding in the dark grout. I used distilled water to mix the grout for my backsplash tile, and got no such clouding. I therefore believe that dissolved minerals in my tap water caused the lightening/clouding effect in my floor grout. After reading all the comments it sound like I have latex leaching!! What ratio of water and vinegar to I use and also the ratio of muriatic acid. My contractor recommended acid but no ratio, he also is to busy now to come and help me. You think I choose the wrong contractor?? I do not know this, Paul — I recommend you consult with a pro. Good luck. Okay so recently my wife and I have “gone to town” with a steam mop (as stated above) on the tile in our entry way. We noticed white spots on the grout as well as the tile itself afterwards. A couple of the spots where the still hot mop was left for a minute or so and some spots just from using the steam mop and then moving it off of the tile afterwards. The spots where the mop was left standing on the tile look a little worse than the others. The grout color is dark gray I think. (It is 56 years old, assuming it has never been re-done so it’s a little hard to tell.) So is this efflorescence? The wifey has been pushing for replacing the tile for a while now and this has only accelerated that discussion. I was hoping that steam cleaning this tile would give it new luster but it sure has made it look worse. Any help/ideas would be greatly appreciated!